← Start The Bread Tonight! Eat This Tomorrow! Four months is a time of really major change for most babies. It’s the end of the “fourth trimester” as each baby emerges from the newborn “eat, sleep, poop, eat, sleep” phase and enters real life. Ellie threw us (but particularly me) for a loop when she turned four months. Basically, her sleep habits (particularly in the daytime) changed drastically and I struggled for several weeks to figure out the “new” Ellie. I blogged about it here. 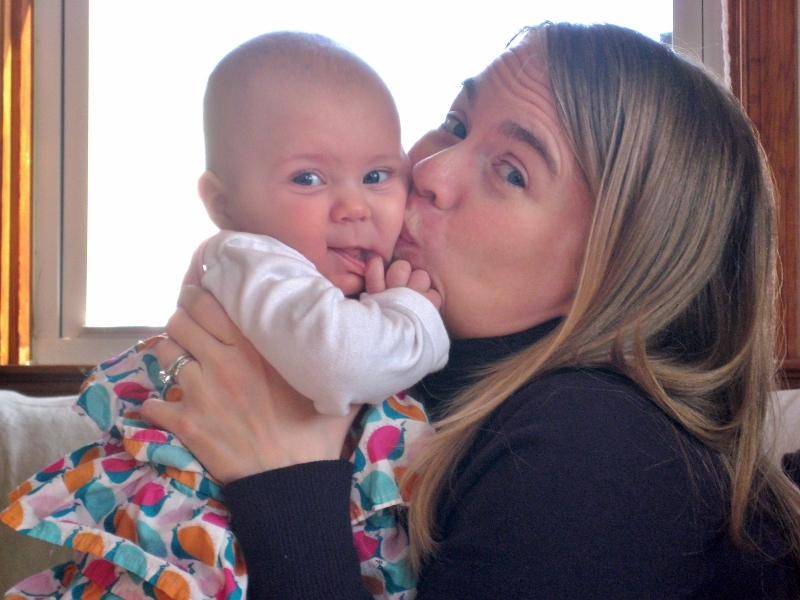 A couple months after Ellie turned four months, I found this blog post with some wonderful information about 4-month0olds. In that blog post, she links to this blog post about sleep regressions (which she doesn’t like the term for) and 4-month–olds, which I really wish I had read before Ellie turned four months. I try to remember to send these links to all the new moms I know because sometimes just having a little information makes it a lot easier to roll with the changes. When everything I’d known about Ellie and her sleeping habits changed around four months, I thought I was doing something wrong. Last week, Ellie (who just turned 4 months) decided that she was not willing to take a nap unless she was being held. And so for almost a week, either my husband or I have had to hold her in order for her to get any sleep during the day. My husband is a teacher so he was home for three days last week, which made life MUCH easier. And yesterday’s snow day was a blessing too. But all of this holding is wearing me down and I didn’t realize how much the break that I got while she napped meant to me. Dr. Sears says that it takes a baby about 20 minutes to drop into a deep sleep and so if we rock her for that long, she will at least stay asleep when we put her down. But that only lasts for maybe 5 minutes before her eyes have popped open. So here’s my question – is this my fault? I tried my best to get her to take naps by herself and she was doing great until last Thursday when all of a sudden, she just changed. Is this just a stage? Do I just have to get through it? Is there something I can do to help her learn to sleep by herself again? I wear her in a Moby wrap a lot but she rarely is willing to fall asleep in it and when she does, she only sleeps for a few minutes. Even when we’re holding her, we’re happy if she sleeps for 45 minutes. So she’s definitely not “consolidating” her sleep like she supposedly should be doing now. She thankfully is still sleeping fine* at night. It’s just daytime naps that are hard. Thanks for any advice you might have. I’m starting to feel a bit desperate. It’s OK. Every** baby goes through this. 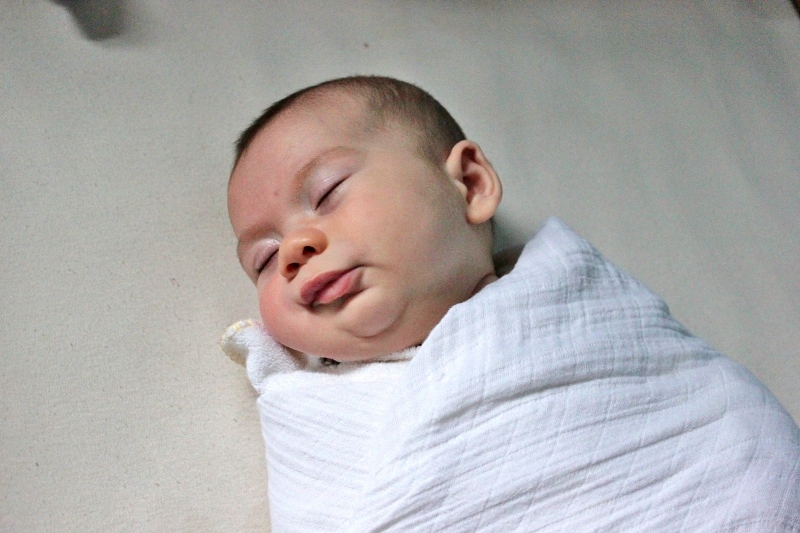 The sleep part is hard, so hard, but wow, a four-month-baby is so much fun in so many other ways! You haven’t done something wrong. Respond to your baby in the way your mama-heart tells you is right and good. You will get through it and definitely ask for help if you need it. *In that email, when I wrote, “Ellie is still sleeping fine at night,” please don’t interpret that to mean “sleeping through the night”. She was still probably nursing at least 2-3 times during the night, if not more. It’s just that her night-time sleep didn’t really change. She wasn’t one of those mythical babies who slept through the night at six weeks. For many babies, however, they do sleep for longer stretches at night at first and that tends to change as well around four months. **Technically speaking, every baby goes through the four-month change but I do have to say that I didn’t even notice it with Mark. The poor guy was just carted around everywhere with Ellie and I didn’t have the luxury of worrying about his naps the way I did with Ellie. I did notice that he started napping on his own around five months. I was anticipating an Ellie-like nap experience, so I was thrilled when he started napping on his own so soon. 🙂 It’s all about your expectations in so many ways! This entry was posted in Ellie, Mark, nursing, parenting and tagged four-month-olds, fourth trimester, why is my baby not sleeping?. Bookmark the permalink. I know – the BEST!